All sightings from San Francisco Whale Tours vessel Kitty Kat. For our first trip of the day we headed west towards the Golden Gate Bridge. We had an outgoing tide and strong southern winds. There were many threatening rainclouds. We were just outside the bridge when we saw a spout near the north tower. The tide was sucking us out quickly, so we positioned ourselves inside the bridge to observe the whale. The gray whale was coming up infrequently and staying close to the rocks near the tower. 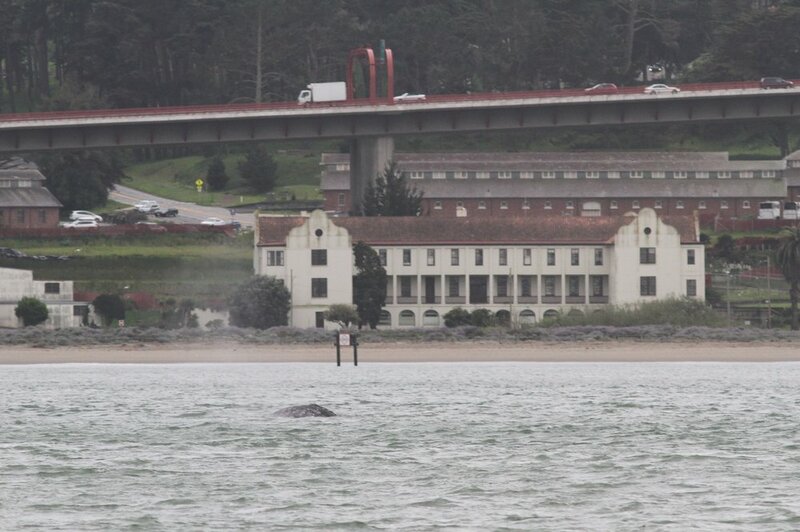 As we floated, another crew member spotted a whale near Crissy Field. We went towards that whale. As we floated near Crissy Field, we watched as the rain approached from the ocean. The rain passed over us and eventually it cleared back up beyond the Strait. On our second trip we headed back towards the Golden Gate Strait. We spotted a couple of spouts between Baker Beach and the South tower. We still had an outgoing tide pulling us west, but we were able to float in neutral and have one whale in front of us and one behind us. There was a third whale even farther west. 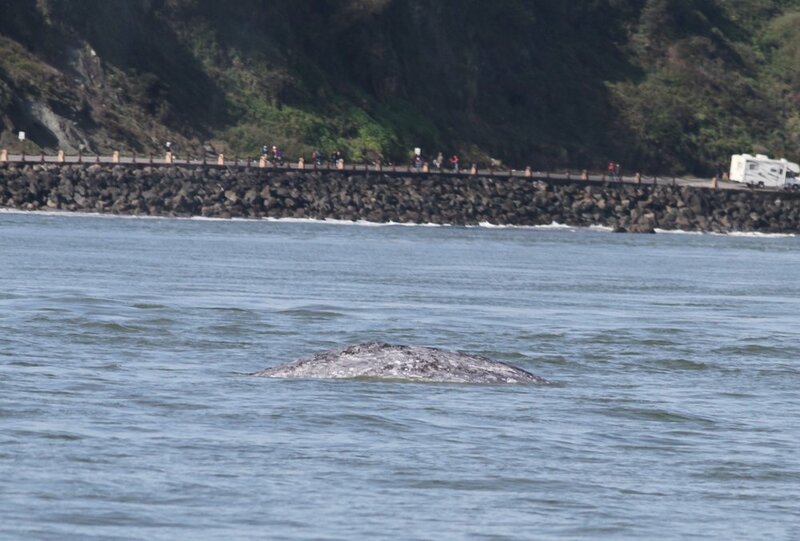 A few times the gray whale closest to the bridge approached within 70 yards of us. There were lots of birds, seals, and porpoises near the bridge as well. On our last trip of the day we found two gray whales between Fort Mason and Crissy Field. Both animals stayed close to shore. The tide started to come in, so we positioned ourselves west of the whales and let the current push us alongside them. We saw several large ships pass by us. 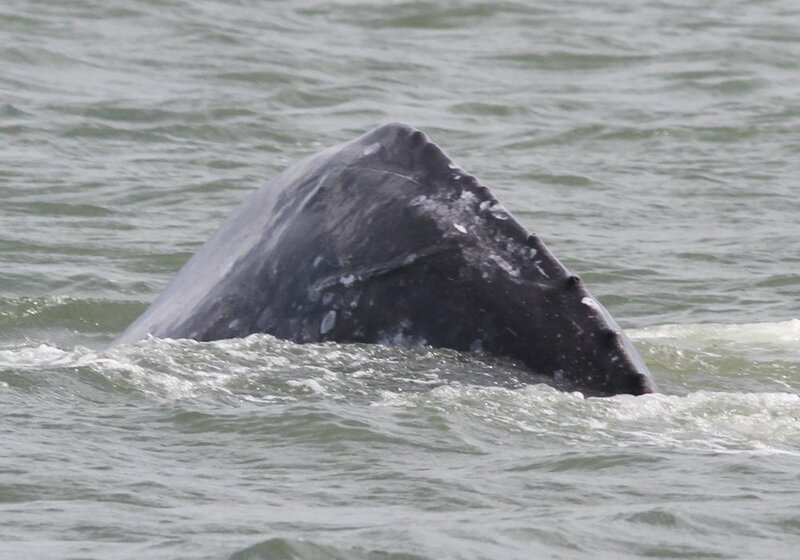 On our first trip of the day we headed out with a few reports of gray whales in San Francisco Bay. It was only a few minutes before we found the first spout, just east of our harbor. The whale was surfacing every few minutes in the ferry lane. After watching this whale for a while, we continued west and found another whale near Crissy field. This whale was very close to the shore. Neither animal showed its flukes. On our next trip, we started off west and immediately found a gray whale near Fort Mason. The whale came very close to the shore, swimming in about 30 feet of water. At one point a whale approached our boat within 100 yards. We eventually found another whale near Fort Mason, but farther from the shore. We also saw spouts near Crissy Field. On this trip e headed back towards the spot where we’d left whales on our previous trip. We found one near St. Francis Yacht Club. While we were enjoying this whale, a young sea lion came up to our boat and swam around it for ten minutes. It leaped in to the air and darted around us, staying within a few feet of the boat. The whale moved around the Aquatic Park, slowly making its way west. Eventually we lost it. We thought near the end we saw spouts just on the other side of the Golden Gate Bridge, so we headed that way to try to get one last look. Near the bridge we saw harbor seals, porpoises, tons of bird activity, and a lot of anchovies on our fish finder. Sighting from January 17, 2019 at Estero Bluffs State Park in Cayucos, CA. Warning: This post includes a photo of a recently stranded dolphin. The photo is not graphic, but the animal is deceased. The photo is the last one in the post. Estero Bluffs State Park is a beautiful protected area. There are multiple access points from highway 1, making for a secluded adventure. The day we went was misty, right after a lot of rain. This created many small rivers flowing down to the cliffs and the sea. Morro Rock was just barely visible in the distance. Wandering along the cliff’s edge, we spotted a multitude of sea and shorebird species, including black turnstones, western grebes, and a surf scoter. We spotted a couple of egrets hunting in the grass. Some species, like whimbrels, sandpipers, and the black turnstones, were looking for food in the intertidal zone or up on the bluffs. Many were bathing in puddles, including a savannah sparrow. It was high tide. We spotted dozens of harbor seals poking their heads out of the water. As we made our way north, my friend Alicia pointed out a burrowing owl right on the edge of the cliff. It was staring straight at us. We gave it a wide berth so as not to disturb it. The water farther north was a little less protected, so we saw larger surf. There were harbor seals and sea otters in the surf. One pair of sea otters appeared to be a mother and pup, feeding and playing in the kelp. In this area we spotted a pair of black oystercatchers on the rocky beach. We slowly turned and headed back south. The tide had gone out significantly and as we came back to our first spot we noticed that lots of the harbor seals were now resting on rocks instead of swimming. We also spotted a pair of turkey vultures flying low overhead and eventually resting on the bluff edge. With the ebb of the tide, we also noticed what appeared to be a common dolphin carcass. It was fresh with only a few small scratches on its body. I took the coordinates of the location and called the Morro Bay Marine Mammal Center. They responded to the call and recovered and necropsied the animal later that day. Sightings from January 16 at Morro Rock and Morro Rock Beach in Morro Bay, San Luis Obispo County, CA. I have a sister on the sailing team at Cal Poly San Luis Obispo who always tells me stories of the sea otters she spots during their practices. During a visit to see her, I made my way out to Morro Rock to spot some otters for myself. Luckily for me, otters live in Morro Bay year round and are easy to spot from the shore. As we walked along the path between the parking lot and Morro Rock, we spotted several otters in the channel. They floated on their backs, eating or cleaning themselves. Morro Rock is also an important nesting site for raptors. Read more about the amazing recovery of raptor populations in San Luis Obispo here. We spotted both osprey and peregrine falcons. There were also a number of seabirds and shorebirds closer to the water. On the other side of the rock, near Morro Rock Beach, we spotted a pelican in breeding plumage. The wind and surf were high and we caught some surfers in action as well. On this trip we headed out into the Gulf of the Farallones with beautiful weather. There was sun, very little wind, and gentle swells. We spotted porpoises, sea lions, and harbor seals on our way out into the shipping lane. About 13 miles west of the bridge we found our first humpback. The animal kept a distance from us and appeared to be travelling. It had a low spout which made us think it might be a gray whale at first. Off in the distance we spotted a huge group of birds and a couple spouts. We decided to leave the whale and approach the spot with more activity. In this area we found two humpbacks. They were active and showed their flukes. One of them stayed closer to us, once coming within 50 feet of the vessel. We used happywhale.com to identify this whale as an unnamed individual in the North Pacific catalog. It had previously been seen in Monterey and Puerto Vallarta in 2016. This whale rolled onto its side and showed us its pectoral fin. For our first trip we headed west of the precautionary area. We found at least ten whales just west of buoys 1 and 2. There was a ton of bird activity all over the shipping lane. We saw some anchovies boiling at the surface, which let us know what the whales and the birds were feeding on. We saw feeding behavior, including a few lunge feeds. We were able to identify several of the individuals in this sighting. Many ships passed by us during this trip. 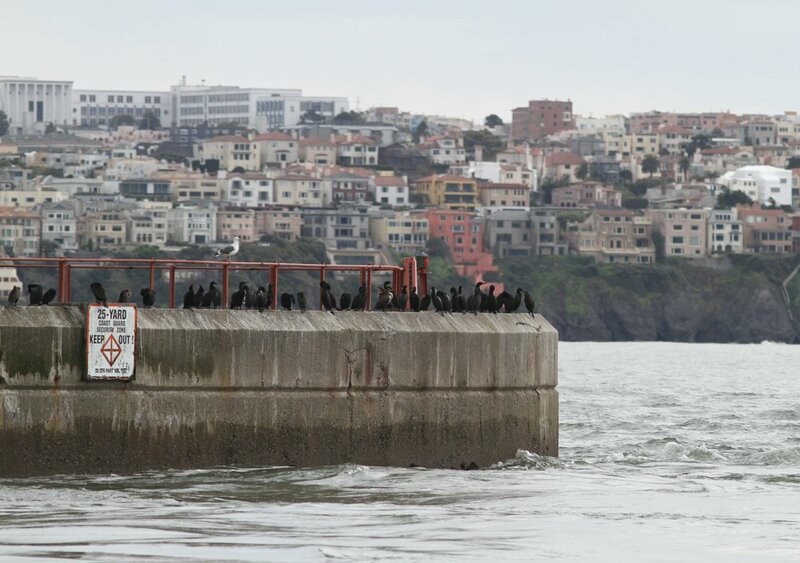 We spotted some California sea lions on the shipping lane buoys. We also had some harbor porpoise activity. We returned to the same spot on our next trip. On our way out we spotted more sea lions. Some of them were porpoising. A little bit farther west we found 5 humpbacks. The whales kept a distance from us, but we were downwind and were able to smell their breath. There were lots of birds in the area. We confirmed that at least three of the individuals we saw were the same ones we had seen on the previous trip. On our final trip of the day we headed a little bit farther north than the previous trips. We found three whales, all far from each other. One whale near a container ship was breaching repeatedly. We did not see fluke dives from the other whales. They kept their distance from us. We did see lots of bird activity and some sea lions on the buoys. On this trip we had a northwestern wind and swell which pushed us south to Pacifica. We found two humpback whales there. We saw a few fluke dives and lots of bird activity near the whales, which were relatively close to shore. One of the whales breached 150 yards from the boat. When we started heading back, we had another whale within a hundred yards off our port bow. We waited for it to pass us before continuing onward. The sea conditions were perfect as we headed out in search of whales. We started off north, noting key signs like the presence of birds and fishermen. We found a humpback whale in this area. The whale did several lunge feeds within 100 yards of the boat. 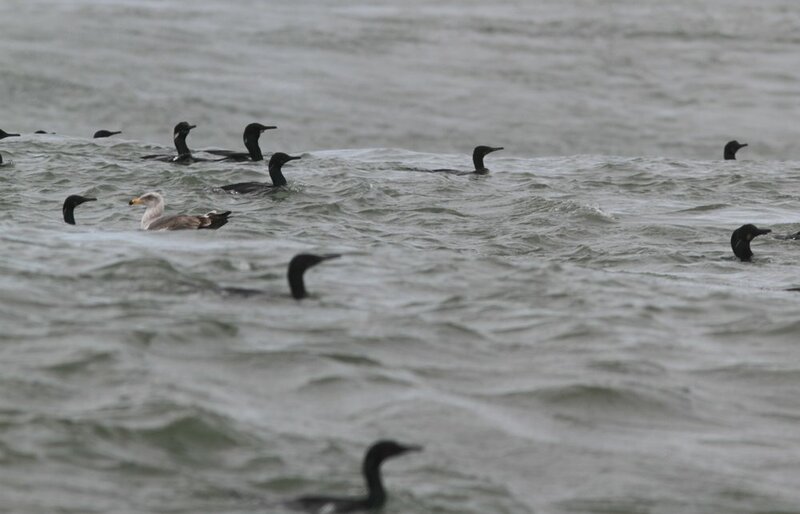 The birds followed the whale around, plucking anchovies from the surface. It was slightly windier as we headed out on our second trip of the day. We found another humpback in the same area. It showed its flukes, but was travelling and stayed at a distance from us. On this trip we headed north towards Muir Beach. There was a lot of bird activity in the area, suggesting it was a good feeding spot. We found one humpback whale near the birds. We were in shallow water, so the whale was not throwing flukes. It did approach within 100 yards of our boat.